The business world is constantly changing. Talent acquisition professionals often sit behind their desks and wonder if they’re doing the right things. There are so many options, sources, and trends to follow; how do these professionals know which is right for their business? 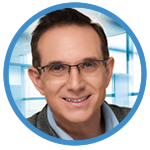 Unfortunately, there hasn’t been a ‘dummies’ version for leadership in the recruitment space until Jeremy Eskenazi wrote one – and now it’s been significantly updated! The RecruitCONSULT! Philosophy is an easy to understand, customize and execute, set of guiding principles to help lead and manage a corporate talent acquisition and recruiting function. In this, the NEW SECOND EDITION on this philosophy, Jeremy Eskenazi coaches, mentors, and provides a complete toolkit to help Talent Acquisition and Human Resource leaders shape and build high performing organizational recruiting functions. With today’s quickly changing Talent Acquisition landscape, Jeremy has made significant updates and added new content that arms leaders with both awareness, and application of how to run the most efficient team. RecruitCONSULT! Leadership provides real life examples, including the cringe-worthy ones, to provide insight on key success indicators like; relationship building, budget management, resourcing, proactive leadership, and of course, measurement. There is no longer a reason to be fearful of last minute recruitment demands, choke-hold processes, and fear of outsourcing. RecruitCONSULT! helps Talent Acquisition professionals from an inside-out, and outside-in perspective of global companies. The RecruitCONSULT! Philosophy helps to dispel the myth that corporate recruiting is a thing of the past. RecruitCONSULT! 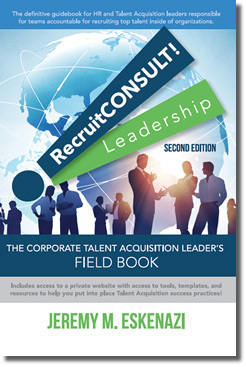 Leadership is the first-ever field book for corporate Talent Acquisition leaders, striving for ‘hire’ excellence. In the Second Edition, you can expect new chapters on technology, tools, a vast expansion on global recruiting, and managing your Recruitment Process Outsourcing relationships. Readers will also have access to a new dedicated section of this website to further utilize the discussed emerging tools, updated research, and more detailed case studies.